“Subject 9,” the title of tonight’s episode, tells us exactly what we are dealing with: the latest bus meta! There’s a small handful of them left for the Thinker to collect, and it seems inevitable that we’re going to be meeting them all in the coming weeks. I’ve been really enjoying these bus metas because they’re each (with the exception of maybe Ralph) weird, under the radar Flash villains that were dug out of comic book history. The creativity that it takes to bring characters that are sometimes just a cool name and gimmick into the modern age for a contemporary viewing audience is impressive and usually makes for good TV, as far as I’m concerned. I will confess that even though I think the idea of body-jumping is a big scale way to do something different with a series-long villain on The Flash and it’s a cool shorthand way to remind us that we aren’t dealing with yet another bad guy speedster, Neil Sandilands (the actor who played the very first Clifford DeVoe we ever met), will always hold a very special place in my heart and I am sad that he’s gone. In this incarnation, he was a repeat foe of Jay Garrick and the Justice Society of America. This might be telling. We know Jay Garrick is coming back to The Flash pretty soon (yay!). Is this the makings of a potential showdown? I could get behind the elder Jay Garrick fighting this new form for the Thinker. After CRISIS ON INFINITE EARTHS, Isaac enjoyed a little baby retcon. He emerged as an English aristocrat with a talent for music and a love for travel. However, this Fiddler still wound up in India and still went to jail. I remain pretty convinced that the surname Bowin is derivative of that fact that violinists and fiddlers use a bow to pluck the music from their instruments. That might just be me, but if it’s not, I’d love to read your conspiracy theories about Isaac Bowin’s name down in the comments section! Tonight in “Subject 9,” we met Izzy Bowin—a lady version of the classic Fiddler. On a normal day, I’m all onboard with gender or race-bending a character. Izzy being Izzy is cool and I think making her a contemporary musician rather than a classical prodigy, like Isaac Bowin was, is fun. I do think it’s interesting that in comic book continuity there is already a female derivative character based on the Fiddler. She was created by Gail Simone and Dale Eaglesham in their miniseries VILLAINS UNITED back in 2005, and her metahuman name is Virtuoso. Now, based on the events—and particularly the ending—of “Subject 9,” it is evident that Izzy is going to be sticking around The Flash for at least another couple of episodes. There is a chance that in this time, her character-through-the-lens-of-Clifford-DeVoe is going to evolve to envelop aspects of both characters’ personalities. Who knows? I just really wanted to mention Virtuoso because I think she has one of the coolest evil lady villain names of all times. Virtuoso is a member of the Secret Society of Super Villains who puts herself forward as a foe of the Secret Six. Like the Fiddler, Virtuoso has some abstract ties to India. She has a Hindu caste mask. 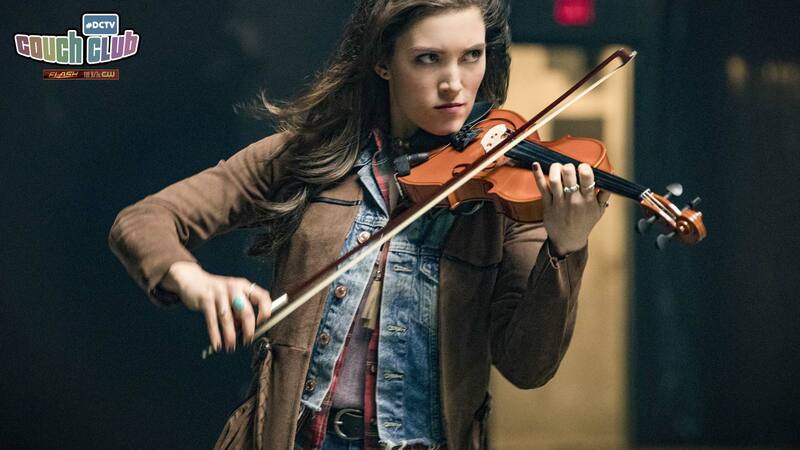 She also appears to have the Fiddler’s original violin in the wake of his death. I dig the implication that these two characters might be more deeply tied together than simply sharing musical-based metahuman abilities. Fun fact: If you or a tiny human you know are intrigued by a lady version of the Fiddler or a fan of Virtuoso you’re going to want to check out Lisa Yee’s DC Super Hero Girls prose books where she plays a pretty important role. So are you as glad as I am that The Flash is back? If so, I hope you’ll join me again next week. See you then! Ashley V. Robinson covers The Flash as a part of the #DCTV Couch Club. You can find her on Twitter at @AshleyVRobinson and on the Jawiin YouTube channel. The Flash airs Tuesdays at 8 p.m. (7 p.m. CST) on The CW. The Flash: What the Heck is Flash Time? The Flash: Team Kid Flash No More? The Flash: What Were You Thinking?